If you had asked teenage Ngozi five years ago if she was a feminist, she would have vehemently denied the label. “Femi-who? Femi-what? No-o!-please I want to get married in the future and have children”. I was fully convinced during my teenage years that feminists were women who had become sexually frustrated spinsters, or whose husbands had left them for much younger women, leaving them sour, bitter and thus very anti-men. Don’t get me wrong, I was very much inspired by people I considered women activists, women who constantly fought for political equality in Sierra Leone, equal economic and property rights, and rallied against Female Genital Mutilation, Domestic and Sexual Violence .I was interested in Women’ s Rights too, and would argue for hours on how gender roles should be examined and why women were expected to marry at a certain age and bear children, as if that was all there was to womanhood. At around the age of 16,I had started thinking very radically about my position as a young girl in what I considered (and still do) a predominantly patriarchal society where the bearers of witchcraft, evil and juju were mostly always characterized as women and unmarried middle-aged women were considered failures of true womanhood. So yes, 16-year-old Ngozi was passionate about Women’s Rights, but feminism? That was another level! Too extreme! I was a feminist-but didn’t know it. A huge part of my denial to call myself a feminist is that I simply didn’t understand what it meant and couldn’t identify with it within my context. Could I be blamed though? I couldn’t name up to three African women, who I could call feminists, because I had never been taught about them. People hardly made reference to African feminists like Wambui Otieno of the Mau-Mau Rebellion in Kenya , Huda Sharawi of Egypt, and Margaret Ekpo of Nigeria. Even now in college, I remember having a class about Race and Gender and all the feminists I studied were either American or British, like Margaret Fuller, Mary Wollstonecraft or Betty Friedan. So I was far removed from this idea of feminism-that was extreme and sort of foreign-I thought. I did not want to be perceived as a “man-hater”. Feminists have always been ignorantly labeled, as those who completely hated men, wanted what men had, and were jealous of the phallus, and I did not want not be associated with this. By society’s popular lens, any woman who is not attached to a man and who is always vehemently calling out men’s actions has to harbor some form of sexual repression or sexual “deviation”-neither of which I did. Now to the deep explanations of why I didn’t want to call myself a feminist. Feminism has always been termed as an extremist concept. I wanted to fight for women’s rights, for equal respect and equal access to opportunities, but I always thought feminism was on another level of extremism. There were certain sayings that feminists actually wanted women to start behaving like men and were trying to devalue the basic tenets of womanhood, like child bearing, motherhood and marriage. Feminism seemed to be for the intellectual elites. The few women who openly identified as feminists in Sierra Leone were primarily from the elite. They were either politicians, successful lawyers, or had come from very wealthy families. Besides, the women who were feminists in the elite only seemed to interact with “grassroots ” women and engaged in “grassroots activism” when it was convenient for them. I did not see myself in that picture; I did not like the attribution of feminism to elite, rich, women who intellectualized it. I finally overcame my perceptions of feminism when I started to understand it better. However, when I finally embraced it, I retreated sharply again- there was a problem. I couldn’t understand why African feminists were not included in the global feminism discourse! In fact, that was when I started to understand the general image of African women on the global platform. We were either ‘NGO-ized’, helpless and always in need of and receiving aid, or extremely empowered, and the images of these women were usually Presidents-(think Ellen Johnson Sirleaf.) There was no place for the regular African woman in between. 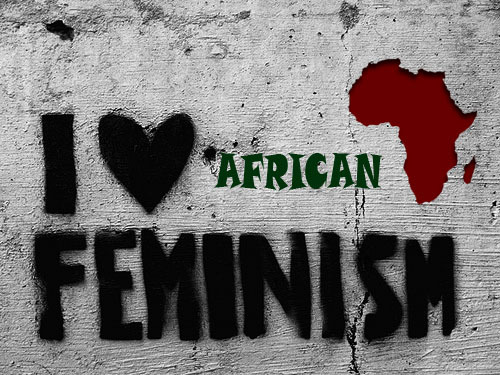 That was when I decided to adhere to a type of feminism that was specific to our circumstances-African feminism. Feminism in Africa is not foreign and was not brought to us by our western feminist sisters, it had always existed, it had just not been always been called feminism. Women have historically found methods of resistance to patriarchal oppression within their societal contexts. In the global feminist discourse, it seems that African women or “third world” women in general, need to be informed of both their rights and how to fight for these rights, with a huge chunk of contextual adaptation and history of resistance to oppression, missing. The goals of feminism somewhat diverse across contexts and cultures but still very clear in terms of two things: equality and fighting gender discrimination and oppression. Feminism is not just a concept or a label-it is a way of thinking, which is why it cannot just be limited to women. Men who support feminism do not perceive equality of rights and access to opportunities as a threat, but as a necessary step to the betterment of that society, because equality of rights and access to opportunities leads to economic empowerment and thus economic growth and innovation in a variety of ways. It has been a long journey and I am still not quite there. However, I pride myself in the knowledge that I am finally comfortable being called a feminist. I specify my feminism as African because African women face four layers of oppression- oppression by gender, oppression by certain traditions and customs, oppression by race and negative stereotypical perceptions of African women, and oppression by the economic strata of coming from developing countries. I use “African” as a term not to ignorantly generalize and take away individual national agencies, but because women in African countries do face similar issues across cultures, contexts and countries. The specification of African feminism is not to shrug of alliances of western feminists, but to help them recognize that intersectionality is imperative when forming alliances-and mark my use of the word -ALLIANCE. Not an arrogant notion that we need to know our rights and thus have to copy methods of fighting oppression from western or “first world” feminists. There is no shame in identifying oneself as a feminist, because the goals of feminism are very clear: fighting against patriarchal oppression and hegemony and for equal rights and access to opportunities. I reiterate, feminism is a way of thinking, and if you are still not comfortable being labeled as a feminist, then you can think of it as a gradual change in mentality. Anyhow, shying away from the term is reinforcing patriarchal and intra-gender impositions of what constitutes true womanhood thus reinforcing hegemony and sexual oppression. As I reflect on the second part of this piece,please watch this video by Chimamanda Adichie on why everyone SHOULD be a feminist.